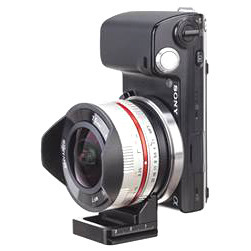 Introducing a new Nodal Ninja conversion kit for taking photos with Samyang 7.5mm on Sony Nex. You will need 4 photos to cover the entire spherical field of view with this kit. Together this creates the best compact light weight camera lens combo with APS-C sensor ever, delivering great balance of image quality, weight, size and cost for creating virtual tours. The conversion kit for Sony E-Mount can already be purchased on our shop. Versions for EOS M, Fuji X and NX are in preparation.